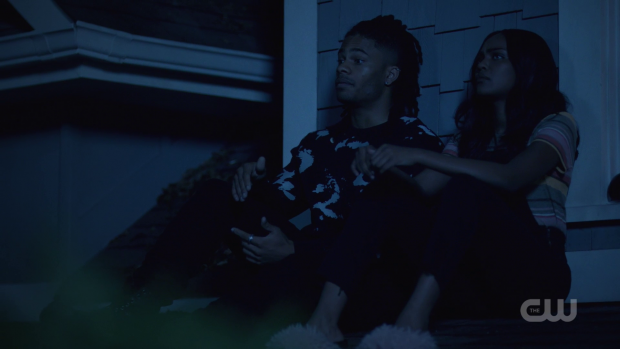 Black Lightning expands its world by introducing South Freeland while the characters process the consequences of the events of the previous episode. TV shows with worlds that feel like they continue to exist outside of the perspective of the main characters are often stronger than those who don’t. Even if it’s not realistic a fully realised world with its own rules, politics and major events helps viewers to invest in everything the show that lives in it has to offer. 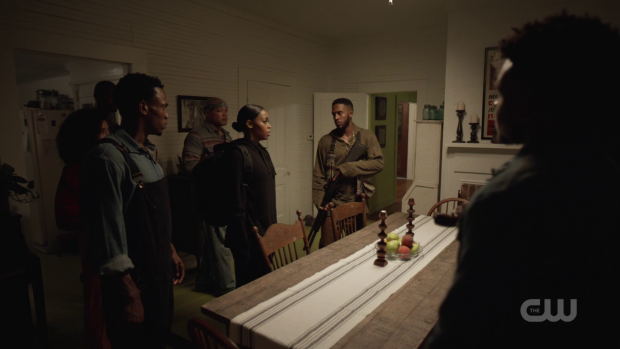 Black Lightning has always been good at this with an intricately defined fascinating social structure to Freeland that works with, against and in spite of the characters that the show focuses on. Expanding that world could be a double edged sword as there is potential for an awkward juggling act between settings that don’t outwardly compliment one another. It’s far too early to tell if that will be the case here and for now the expansion is working really well because it has increased the storytelling potential a great deal. South Freeland makes for a compelling addition to the Black Lightning mythos. Anissa is the outsider who gets to learn how the place works and it really feels like she has stumbled into a living breathing place that doesn’t need her to give it any sort of definition. When Anissa arrives it’s a community that is fully formed and she is very much an intruder into it. She is welcomed because she has a desire to help Anaya (Birgundi Baker) because she feels responsible for her after the death of the father of her children Anissa’s sense of responsibility brings her to south Freeland to give Anaya the help she wasn’t able to provide last week. As luck would have it this is the time Anaya goes into labour making Anissa’s presence timely in a way that only really works on TV. It seems that the quickest way to build trust is to help a young woman deliver twins. It’s a less than idea birth but Anissa shows herself to be calm and knowledgeable despite the complications that occur during the delivery. Not only is Anaya having twins but one of them is breach so that requires extra effort to ensure a safe birth. There are complications following the birth when one of them is white and the other back along with both being born with super powers. The super power problem is an issue that’s tabled for now because the fact that one is white and the other black is a much more significant issue. South Freeland is a divided community where the black people decided to come together following the abolition of slavery and make the place their own. They have a fairly quiet existence living off the land and growing things that can be sold in order to support them. This group are known as “The Perdi” and have a long standing tradition of solidarity within the confines of the community they have built. Another side to South Freeland exists known as the Sange, lead by a metahuman known as the Looker (Sofia Vassilieva) who can control people by imbuing them with a silver substance. There is no love lost between the two groups so the prospect of a union between a Perdi and a Sange that produces children is unthinkable. Anaya explains that her father (Warren ‘WAWA’ Snipe) hates white people which definitely comes across in his behaviour so the children will never find approval in the community. I suspect that having one white child and one black child is a deliberate decision on the part of the writers because they represent the division between the two communities. It wouldn’t be surprising if their powers compliment each other in order to represent common ground that the warring factions can find. For now the existence of the children is enough to create an incredibly violent situation so at this point they represent the hatred that the two sides have for one another. These children represent a lot for being mere hours old. The drawback to introducing and exploring a brand new location with so much history is that the episode relies heavily on exposition to get that information across. This basically amounts to a post-natal Anaya describing the political landscape in detail while Anissa listens intently. It’s a clumsy way of getting this information across and not all that interesting though I’m not sure how else it could have been done given the circumstances. In order to create the necessary context for the situation South Freeland would have needed to be introduced earlier in the season which would certainly have impacted other stories. Without knowing where this particular plot is going it’s hard to say whether the exposition dump in this episode will prove necessary to make way for far more interesting content involving the dispute between the two communities in South Freeland. Rushing to get to the next thing is also a problem when it comes to the Looker. 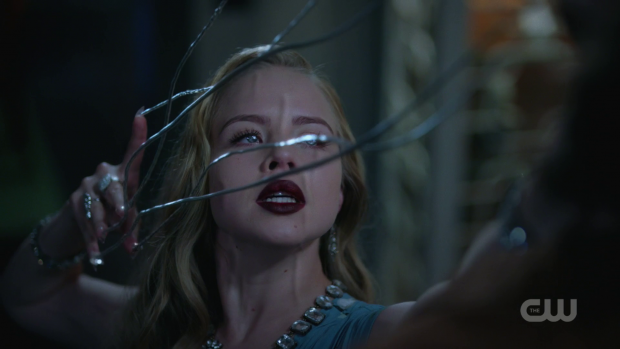 She immediately makes an impact thanks to a distinctive design, impressive visual flair in representing her powers and and a gripping casually sadistic performance from Sofia Vassilieva but her introduction is far too abrupt and gets slightly lost among everything else the episode has to offer. Her performance has potential to put her on a par with Tobias as a villain though it remains to be seen if the writing can match the acting ability. For now she is characterised largely by the mystery that surrounds her abilities and what motivates her to use them in a certain way. She also appears to be linked to Jefferson as another one of the kids infected by the original vaccine so that connection could make for an interesting conflict between them. Her ability to give powers to others could make her really engaging threat. Sending her controlled people after the babies as Anissa and Jefferson fought them off made for a really fun action sequence. The super speed, brutality and use of Jefferson’s powers made it a varied and chaotic brawl with a lot to recommend. Jefferson managing to hit someone travelling too fast to be seen was a definite highlight. This was a strong week for action with the other major sequence being the fight between Khalil and Tobias. At first it seems like Khalil is a match for him but the tide of the fight quickly changes and Tobias delivers a brutal beating that shows Khalil exactly who’s in charge. It’s a harsh lesson in what the penalty for disobedience is. The shattering of the fish tank is a great ending to this beating as it makes for a darkly funny gag that somewhat diffuses the brutality of what immediately preceded it. Khalil’s beating is a reminder of how dangerous a position he’s in and makes it abundantly clear that future failures could end up costing him his life. Jennifer is trying to support him as best she can, showing real empathy for his situation and making sure he’s aware that she is there for him through all of this. It’s abundantly clear that Khalil isn’t a bad person but is stuck in an untenable situation that he might not be able to escape alive. He values his connection to Jennifer because she helps him to retain some degree of humanity but he’s also afraid of being a danger to her so he is very conflicted about what he should do. 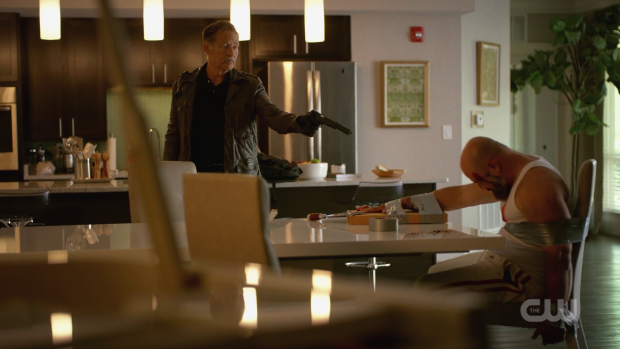 Tobias orders him to kill the Preacher as a test of his loyalty. Khalil doesn’t want to kill anyone so tries to deflect the idea by pointing out that it goes against his plan to legitimately gain a foothold in Freeland. This isn’t something Tobias cares about as he has made a career out of not being connecting to horrific acts of violence. People like Khalil take the fall for him while he continues on largely unscathed. Khalil tries to get the Preacher to leave town as a compromise so that he can tell Tobias that he went through with what he was ordered to do but he refuses because he’s not one to back down in the face of intimidation. He’s very lucky to be attacked by someone like Khalil who has a conscience as he could just as easily have had Tobias send someone not quite as morally upright as Khalil is. Lynn has to deal with the consequences to the part she had to play in the death of 14 of the Pod Kids. She has to explain to the families of those in the pods that 14 of them have died and for some really can’t tell them the names of the deceased because they still have to be identified by their families. It’s chilling to see Lynn deliver that news so dispassionately while those she delivers the news to fall apart in front of her eyes. She hears them say the names of their loved ones, mention details about their lives and sees the pain on their faces while she can do nothing to make them feel better. This does a lot to humanise those lost for her and makes her feel even worse about being manipulated into letting them die. Seeing Lynn so emotionally affected by something is really unusual as she is normally the one holding everyone else together. I wish this had been something the episode spent more time on as it’s such a departure from the character’s normal mindset that it begged to be explored. She drinks a lot and feels guilty but ultimately acknowledges that she would never have gone through with it had she known. Lynn is also confident that all of them could have been saved given enough time which makes the deaths feel even more needless. Jennifer is the only one around so takes it upon herself to be there for her mother. She does so in completely the wrong way as she takes the wrong approach to reassuring her. Jennifer thinks that her mother needs to hear a logical and rational analysis in order to make her feel better so she reminds Lynn that even though the deaths weren’t her fault they were still her responsibility. Why Jennifer thinks that will help is beyond me as there’s no way anyone could hear that and suddenly feel better about what happened. This isn’t a flaw with the episode though it is a flaw with Jennifer who is slowly learning how to care about other people rather than being selfish. It works well with Khalil but she completely misreads the situation with Lynn who needs emotional support rather than the factual logic that Jennifer goes her. Advising her to just ignore what people are saying is really cold as well. The contrast between how she deals with Khalil and how she deals with Lynn shows that growth has been achieved but there is still a long way to go before Jennifer knows what true empathy is. As I always say, character flaws are a good thing provided they inform the development of that character and that seems to be what’s happening here. As predicted last week, Gambi is very much alive. His escape from the car is fairly ridiculous and he spends most of his screen time trying to find his attempted killers. It does little more than confirm Gambi is alive which feels like it comes a bit too soon considering the emotional upheaval caused by his apparent death carried so much of the previous episode. A strong episode that expands the world of the show, introduces a compelling new villain and continues steadily developing the characters. South Freeland is really interesting with the two warring factions and the large scale animosity that exists between them. Anaya’s different coloured twin children represent a lot considering the are separated by colour, possibly united by their powers and act as a physical manifestation of the divide between the two considering what a union between members of the warring factions creates. Unfortunately much of this is delivered through exposition that isn’t all that interesting to watch though it remains to be seen if it will be necessary over the coming episodes. It does eventually lead to a really fun action sequence. The introduction of the Looker works really well thanks to a captivating casually sadistic performance by Sofia Vassilieva, compelling mystery and impressive visual flair. She is somewhat drowned out by how busy the episode is but certainly has the potential to be on a par with Tobias. Khalil trying to take on Tobias is met with a brutal beating that shows him exactly where he stands as far as Tobias is concerned. His interactions with Jennifer once again help to prove that he isn’t a bad person but is stuck in an impossible situation. Urging the Preacher to leave town is further proof that he’s not a bad person as well. Lynn dealing with the consequences of the role she had to play in the death of 14 of the Pod Kids. Now she has to face their families and tell them that those close to them might have died but she isn’t in a position to confirm who survived and who didn’t. This humanises the loss because she has to look at the pained reactions of the families and have it hit home just how significant the loss will be to them. It’s unusual to see Lynn so emotionally crippled by anything as she’s usually the one holding others together in their darkest moments. I wish more time had been spent on this as it’s uncharted territory for this character so would have been good to spend more time on it. Jennifer’s attempt to make her feel better is badly misguided because she assumes that Lynn would rather have a logical analysis of the situation rather than emotional support. It’s a character flaw for Jennifer that she’s slowly getting better at but it’s part of her ongoing development and a learning experience for her. Gambi is unsurprisingly still alive which makes for an underwhelming reveal as it comes during a very busy episode. Considering the emotional impact his apparent death had last week it might have been better to leave it longer until the audience learned of his survival.